Paul Greengrass has a way of putting viewers at the center of chaos and holding them in place for the duration through his use of handheld camerawork and no-nonsense storytelling. Whether Bloody Sunday‘s gut-wrenching depiction of the 1972 Derry civil-rights massacre, the split-second action of his Bourne excursions, or the confusion and terror sealed inside United 93‘s airline and air traffic control centers, Greengrass makes both popcorn thrillers and historical docu-dramas seem visceral, vivid and immediate. Green Zone, which begins on the first night of the 2003 “shock and awe” campaign in Baghdad, manages to combine the sharpness of those historical tales and the whip-smart action of the Bourne shenanigans to create a taut, non-stop thriller that is as engaging as it can be nerve-wracking. Roy Miller (Matt Damon, exchanging his Bourne identity for a more realistic character) is a warrant officer with the U.S. Army, leading a team of soldiers into alleged WMD locations around Baghdad. Miller’s problem is questionable intel that leads his team repeatedly into empty sites, placing his men in unnecessary danger. Miller has no qualms about voicing those concerns to high-ranking officers, but the only person interested in his experiences is grizzled CIA liaison Martin Brown (Brendan Gleeson), who confirms many of Miller’s worst suspicions. After a fed-up Baghdad citizen the team calls Freddy (Khalid Abdalla) reports seeing a meeting of Iraqi leaders, Brown places Miller on the path of General Al Rawi (Igal Naor), in an effort to find an intel source known only as “Magellan”. This places Miller “off the reservation” as he seeks out answers using Freddy as a translator. 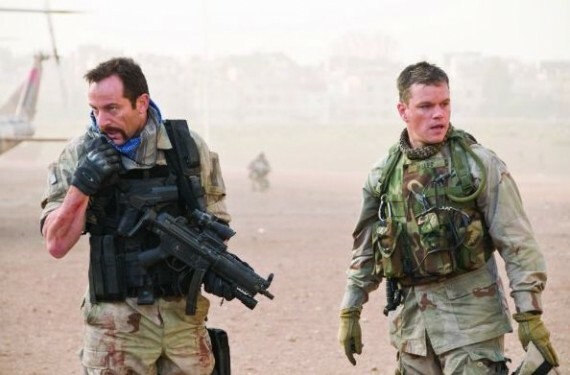 But Pentagon liaison Clark Poundstone (an oily Greg Kinnear) wants Miller to turn over his information, and when it becomes clear he won’t, Poundstone utilizes a Special Forces team (led by an almost unrecognizable Jason Isaacs) to take care of Miller, Al Rawi and anyone who gets in the way. Gleeson and Kinnear are terrific in their smaller roles, but Matt Damon absolutely owns the show. Roy Miller is a man tightly wound by his training, expertise, cadence and surroundings, and whether rattling off a stream of orders to his team, engaging in a firefight or making his way through the close, winding corridors of nighttime Baghdad streets, Damon sets a tall order for any upcoming action heroes for the rest of the year. He and Greengrass work well together, and it will be interesting to see where they team up next. A film like Green Zone doesn’t have to be completely testosterone-laden, but Amy Ryan’s news reporter is the weak link of the cast. The blame really falls to the screenplay, as the character is given little to do other than ask for information, and then ask if that information is accurate. It is a pivotal role, but doesn’t have enough substance, and ultimately gets pushed to the side in favor of the persistent action. While the political essence of Green Zone can be boiled down to the repeated response of “Don’t be naive,” the persistent ratcheting of tension makes you forget the simplicities of plot and unlikely timing of events. Green Zone is a consistently satisfying piece of action cinema, with a barbed edge for anyone who might believe the U.S. went to war strictly to instill freedom where a brutal dictator once reigned. The final image gives away what should be obvious to anyone who isn’t naive about such things. Greengrass has the unenviable and unsympathetic task of taking unpleasant realities and creating entertainments, and he does his job exceedingly well.